Precision Glassblowing repairs and modifies hundreds of pieces of glass each month. Most broken items can be repaired in 2 weeks or less. A 48 hour rush service is available for an additional charge. Call 303-693-7329 or e-mail for pricing or information. For your convenience, a link to our repair form has been provided. Simply print and complete a copy and include it with the broken items being shipped. We’ll contact you once we’ve received the parts and evaluated them for repair. Precision Glassblowing repairs hundreds of torches each month. We can replace the outer shield, base or sidearm of most broken or used torches for much less than the cost of a replacement torch. 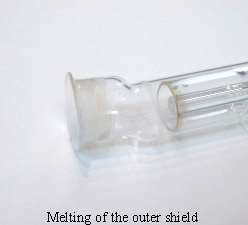 Ceramic base torches for TJA instruments may be rebuilt multiple times at a very moderate price. Available with or without a new injector, rebuilt TJA torches receive all new precision i.d./o.d. 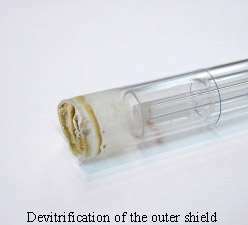 quartz inner and outer tubes and new argon fittings with the used base remaining as the only aspect which separates it from a brand new OEM torch. Once any torch has been rebuilt, it passes through the same QC program as our new torches, guaranteeing it meets original manufacturer’s specifications. Scroll down for more information and examples of what can be repaired. Most broken items can be repaired in 3 weeks or less. A 48 hour rush service is available for an additional charge. Call 303.693.7329 or e-mail for pricing or information. 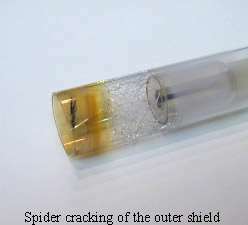 In addition to torches, Precision Glassblowing can repair spray chambers, cells and most general lab items. 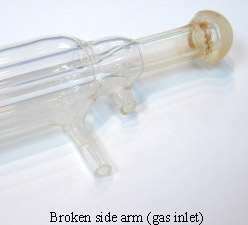 Common lab glass repairs include replacing stopcocks, replacing broken ground joints, fixing cracks in flasks and replacing sidearms on soxhlets and CLLE’s. Some simpler glassware may not be cost-effective to repair but in many cases repairs can save $100’s over the cost of replacement. Most broken items can be repaired in 2 weeks or less. A 48 hour rush service is available for an additional charge. Call 303.693.7329 or e-mail for pricing or information. Do you have a glass piece that is almost just what you need, if only this one small thing was changed? Or do you know of a company that sells something close to what you want, but not exactly? And while Precision Glassblowing has a whole section of our business dedicated to building custom parts, sometimes, is is less expensive for us to modify a pre-existing part that is nearly perfect than to build a custom part from scratch. For easy modifications you can simply add a note near the middle of our REPAIR FORM; but for most situations, it is probably best to give us a call (303.693.7329) or e-mail us to discuss the required changes you’d like made. We can clarify any questions and get the ball rolling on an estimate for you.